Enter Quirky’s Cubo. 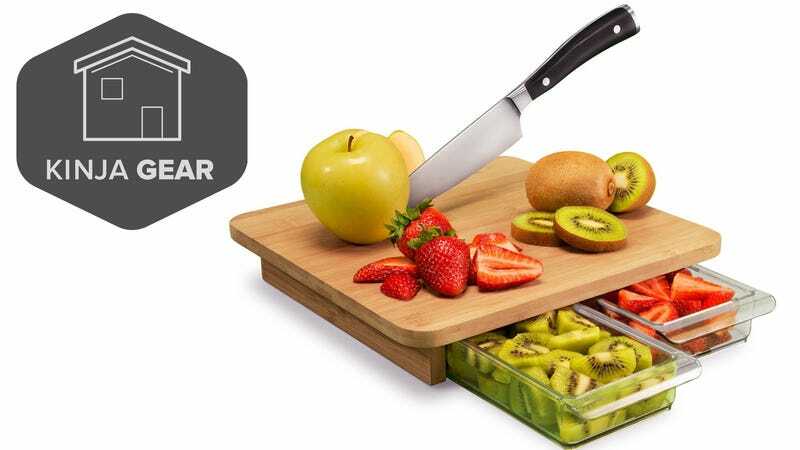 The Cubo is a relatively small, ~$20 cutting board that looks great in any kitchen, but its secret though lies below its bamboo cutting surface. 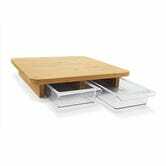 Underneath, you’ll find two clear plastic drawers that slot easily into the Cubo without taking up any additional counter space. That means you can chop your onions and tomatoes on the Cubo, brush them all into the drawers, and push them back under until you’re ready to cook. It’s a little thing, but it makes a big difference if your kitchen is cramped. For reasons I’ll never comprehend, Quirky seems to have basically discontinued the Cubo, so if you want one, you should probably grab it now. Several Amazon sellers have them for a little over $20, which is an absolute bargain in my experience.